It seems like every newly elected Premier in Ontario who wins on even a slightly progressive platform feels like the first step in office is to help the boys on Bay Street relax. And so it is, perhaps, that Premier-elect Kathleen Wynne came out of the gates post-election with two primary (albeit mixed) messages: she’ll promote an activist government but “there’s no new money” for even modest raises in the public sector. Here’s the thing: a broad swath of commentators agree Wynne managed to do the unexpected by securing a majority government. They agree outgoing PC Leader Tim Hudak’s gambit to return Ontario to the days of radical right-wing politics of the 1990s was solidly rejected by the electorate. They agree there is no appetite for ongoing austerity in Ontario. So what’s an activist government to do? Answer: the single most radical, positive move a newly minted activist government could do in Ontario in the year 2014 is to finally and firmly repudiate the most powerful and lasting relic of the Mike Harris era. Repeal the Taxpayers Protection Act – which should have really been called the Taxpayers Avoidance Act, because it was created to put a political chill on any notion that a government in need of revenues would ever consider raising taxes. The Act was enacted by the Mike Harris government in 1999, just as the provincial government was nurturing the ideological illusion that governments can deeply cut taxes while also balancing budgets. The Taxpayers Protection Act set the psychological tone on taxation at Queen’s Park for the next 15 years. It created the political conditions for such a long list of tax cuts that, today, Ontario coffers sacrifice a cumulative of $19 billion a year to the tax cut agenda Harris unleashed in those heady days of right-wing ideology in the late-1990s. To put that in perspective, someone born in Ontario in 1999 is now a teenager who might have spent the better part of his or her educational experience learning in a portable. That teenager has grown up with a political narrative that says governments cut first – whether it’s taxes or services. If the new Wynne government proceeds with the tacit acceptance of the Mike Harris premise on taxation – as did her predecessor – then she will soon find herself making a hasty retreat from any proclamations of activist government. A repeal of the Act would be a symbolic way of putting the past behind us and starting a new chapter. It could be replaced by a series of measures, including the appointment of a blue ribbon panel to look at the wealth of tax revenue tools that could be leveraged to invest in programs and policies that position the province to weather all manner of economic, social, and environmental storms. Economic resilience should be the mandate, especially with the prospect of a slow economic growth future. Economic resilience starts with examining the revenue tools that have been diminished by years of tax cuts. This chart shows there is a path forward that could take Ontario beyond the “there’s no new money” line for a government that wants to turn the page; for an activist government intent on making Ontario economically and socially resilient. We could debate which mix of these revenue options would be worth leveraging. We could debate whether a hike in capital gains tax should come along with a federal hike in capital gains. We could debate whether the HST goes up 1% instead of 2% – and whether some HST exemptions or rebates are in order. We could debate whether a third of these ideas gets implemented. We could debate the timing. We could debate whether some tax ideas are missing – like raising taxes on the richest 10%, instead of the 2% who are being called upon to contribute more in the Wynne 2014 budget. Or we could look at new taxes, such as a carbon tax. 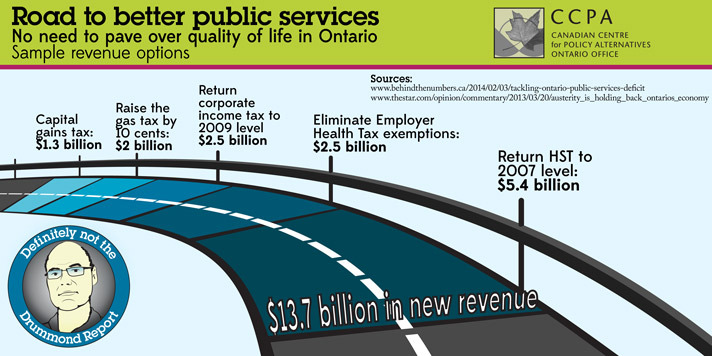 The point is that now is the time to have this discussion, because “there is no new money” confines Ontario to a limited conversation about what’s possible in terms of improving and expanding public services. Avoiding the debate over taxes is so 1990s. And the results are predictable. When Wynne’s predecessor asked former banker Don Drummond to write a report recommending spending cuts without considering any tax hikes whatsoever, the result was predictable. Drummond recommended 362 spending cuts and while alluding to the possibility of tax increases, he left that part of the discussion untouched. The province claims it is now 80% of the way through Drummond’s recommended 362 spending cuts. Ontario now has the lowest per capita program spending in all of Canada and, its corollary: it has the lowest per capita revenues as well. Every time you show the political courage to make responsible taxation decisions to protect and improve public services, you’re casting a vote for the future we want – not the past we inherited. Now is a good time to symbolize that kind of change – for this, and for future generations. Well said – or written! Here in NS CCPA’s annual alternative budget also includes changing tax deductions to refundable tax credits so they are worth the same for low and modest income people as for higher income people. I hope Ontario’s CCPA and the national CCPA take this progressive idea up. Why should someone earning $200,000 get a 50% tax contribution to retirement savings and childcare payments when someone earning $30,000 gets only 25% or less? This leaves aside the question of whether the lower income household can afford retirement savings and childcare. It’s a good response to the “income splitting” and other right wing “fairness” claims.